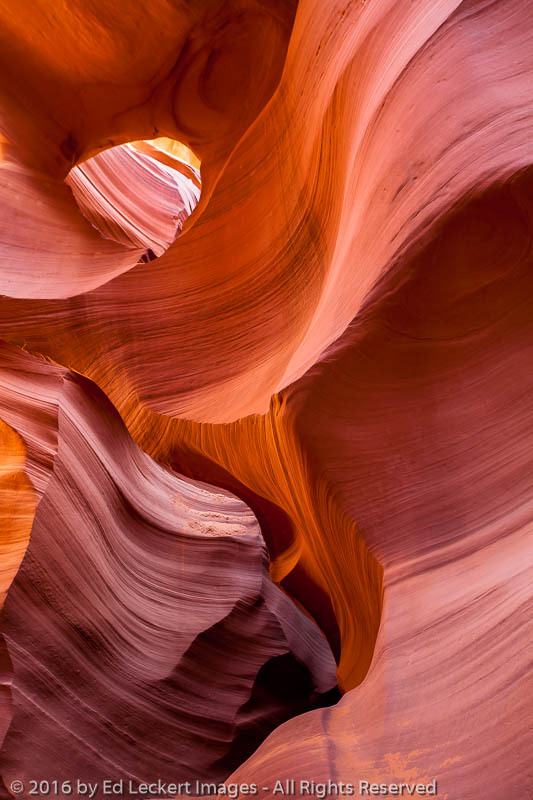 Grooves and curves sculpted into the colorful sandstone create an infinite array of patterns, in Lower Antelope Canyon, near Page, Arizona. *Note: The image above is only a digital approximation of a matted Metallic Paper Print, when framed. The watermark with copyright notice will not appear on purchased prints. Canvas Gallery Wraps are printed on high quality, heavyweight canvas and then coated to protect the surface from scratches and light. Canvases are stretched on sturdy wood frames and arrive ready to display right out of the box. All the hardware you need is already attached. Metal prints are infused right into the surface of a solid sheet of metal for a contemporary look that you'll need to see firsthand to truly appreciate. The result of this process is a rich iridescent sheen, bright vivid colors, and high-definition detail that can't be matched by conventional paper prints. Attached to the back of this thin but sturdy sheet of metal is a floating mount that suspends your artwork ½" away from the surface of the wall. 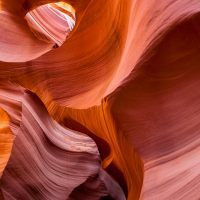 Not to be confused with my metal prints, Metallic Paper Prints are printed on Kodak Professional Endura Metallic color negative paper for a distinctive, eye-catching metallic look. They are signed by the artist and matted using the finest conservation materials from Nielsen Bainbridge. The mat color is Snowflake White. Note that with matted prints, the print is approximately one size smaller than the size of the mat. The size shown is the size of the frame needed. Framing of matted prints in a variety of metal and wood frames is available for an additional charge. Please contact me for details. Cost of shipping will be displayed during checkout. This Shipping Chart shows USPS Priority rates from Boise, ID. Note that because I travel frequently to acquire new images, I am not always available to ship an order out immediately. If you need an order by a specific date, please contact me before placing your order to ensure that I can meet your deadline. When ordering online, shipping is only available to addresses in the United States. For shipping to another country, please contact me directly. Residents of Idaho will see 6% tax added during checkout. A one year full refund or exchange is offered on undamaged prints. Note that we cannot reimburse the outgoing or return shipping charges unless the return is due to a defect in quality. Don't hesitate to contact me if you have a question!